The Perks of Being a Wallflower just came out on DVD recently and is available to you at the Regina Library! Not sure if you’d like it? Maybe you’d prefer the book instead! Take a gander at this book review…this might just be your perfect summer read. Charlie is an outsider, a typical wallflower. He gets bullied at school and prefers taking the forty minute walk home instead of the school bus. Charlie is sixteen years old and when he starts high school, his life is going to change forever. Isn’t this a familiar set-up, don’t we already know these stories where the loser turns out to be the really cool, popular guy? Well all this is true too for The Perks of Being a Wallflower by Stephen Chbosky, but just wait and you will find so much more. This book is going to catch and surprise you every time you turn a page. In a series of letters written by Charlie and sent to an anonymous person we learn about his life, his new friends, his family and especially Charlie himself. He writes about school and his English teacher, Bill, who gives Charlie extra books to read. Charlie then writes essays about them. He would like to become a writer some day. Charlie himself is a mystery. He has mental problems, gets angry, sees things and then passes out. Right before he started high school his best friend shot himself, but there is also another, worse reason for his problems. At school Charlie meets Patrick and Sam, both of whom are outsiders too, just cooler ones. Patrick is gay and before his stepsister Sam introduced him to “good” music, he was a popular kid. They introduce Charlie to all kinds of new things. Parties, drugs and rock music become new parts of Charlie’s life and for the first time he knows what it really means to have good friends. A couple of cartographers named Stephan Hormes and Silke Peust conducted an in-depth study of the ancient, literal names of townships and countries around the world. What they discovered was pretty interesting, and worth a peek! 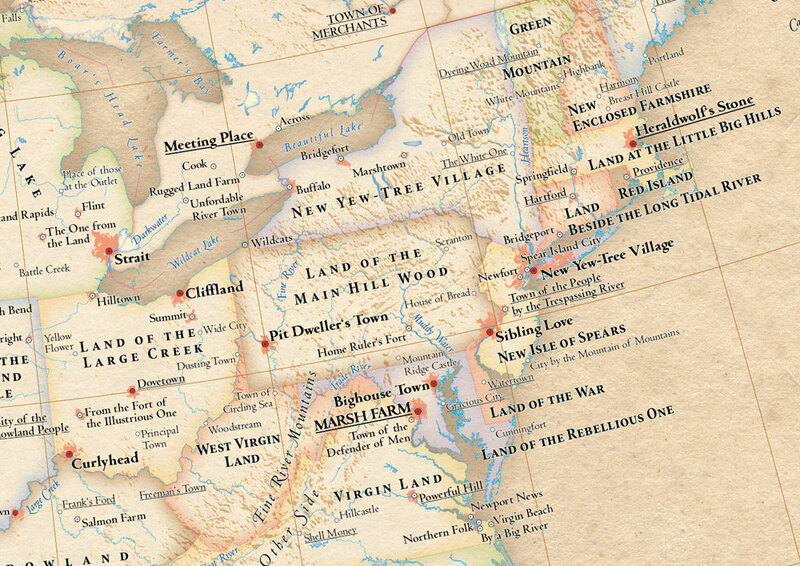 They found that, naturally, most places were named for the natural formations surrounding them…so when do we start calling our state New Enclosed Farmshire? Check our their maps here! Spruce up your research skills! Looking to learn some tricks of the trade when it comes to researching for that paper? Look no further–the library has you covered! TODAY at 12PM and 6PM the library will be hosting drop in informational sessions in the eroom, located on the second floor of the Regina library. Join us for an informal session and have all your questions answered! Remember, you can keep updated on when drop-in sessions are happening through the library’s website, available here! Today is national donut day! Head over to Dunks and get a free donut with the purchase of any beverage before it’s too late! Speaking of donuts, check out some great confection related books, available at the library! Are you working with kids this summer, or perhaps have a few of your own? Babysitting your nieces or nephews and have no idea how to keep them entertained on a rainy day? Fear not! The ERC hosts a Pinterest page that includes teaching resources, but also many, many craft ideas that are easy and fun! Feel free to check back as the seasons change, because there are many holiday craft ideas that might be the next big hit at any family party. With such a rainy day (and sadly more predicted for the weekend), now is the best time to start crafting. Click HERE for your portal into a world of fun!